Planners at Nebraska Innovation Campus today unveiled a new look and usage plan for the Industrial Arts Building, a historic structure at the former Nebraska State Fair Park. 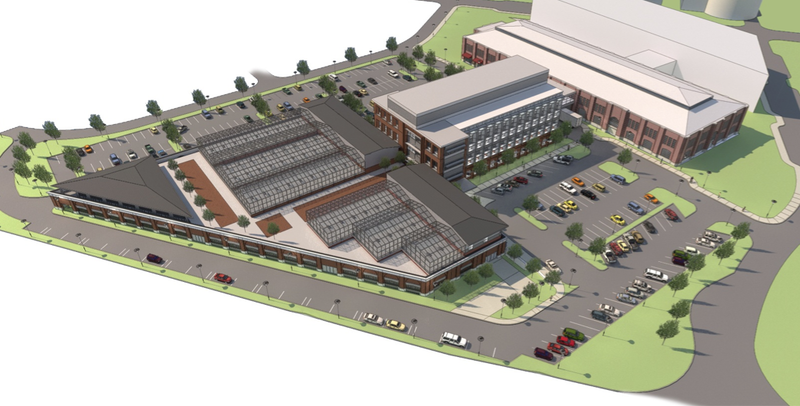 A design concept approved by the Nebraska Innovation Campus Development Corp. maintains the historic footprint and external facade of the 99-year-old building while enabling advanced greenhouse space to be developed on the second floor. Consultants and planners for Nebraska Innovation Campus had recommended the brick-and-steel trapezoidal-shaped 1913 structure be razed to make way for development at the campus. In response to concerns about the planned demolition expressed by historic preservationists, the university initially issued a request for proposals for the building’s redevelopment that failed to attract proposals with financing. In June 2011 Nebraska Nova Development LLC was contracted to carry out the first phase of development for Innovation Campus. That plan included four new or renovated buildings representing an estimated $80 million in public and private investments. The concept for the renovated IAB involves construction of a concrete floor inside the current walls at 17 feet above the current floor. This will allow the first floor to be used for greenhouse mechanical space, high bay research space needs and other functions. The second floor will house state-of-the-art greenhouse space, greenhouse support space and approximately 4,000 square feet of office space. A slideshow featuring images of the redesigned Industrial Arts Building is available at http://www.unl.edu/ucomm/unltoday/. Duncan said the renovated and repurposed IAB will be a research anchor and symbolic gateway building for the campus. It will be directly linked to a major life sciences research facility that will house laboratory space for university and private industry researchers and startup companies. The life sciences building links to the former 4-H building — the east half of which is being renovated into a conference center — which in turn links to a 90,000-square-foot companion building. The result is an initial complex of connected buildings creating the core of Phase 1 of Innovation Campus. Work is ready to begin on the former 4-H building project, to be complete by April 2013. The 93,000-square foot Industrial Arts Building was developed as exposition space and called Agricultural Hall. Following World War I, the Lincoln Standard Aircraft Co. used the building to assemble airplanes. In 1948 it was renamed Industrial Arts. It was closed in 2004 when disrepair rendered it dangerous and useless as fair exposition space. Chancellor Harvey Perlman said the latest plans are exciting and demonstrate the university’s collaboration with the state, local leaders, private industry and historic preservationists. In 2011 the Nebraska Legislature invested $25 million in development funding for Nebraska Innovation Campus — $10 million of which is intended for the renovation of the original 4-H Building. Another $15 million in funding was also offered to be matched by private development, targeted by the NIC corporate board for the creation of the life science building. Funding for the IAB renovation project announced today will be part of the $80 million investment plan announced last June. Located on 232 acres north of City Campus, the former state fairgrounds came into university possession in 2010, and demolition, planning and pre-development have been under way since. The research campus will be a public-private collaboration that capitalizes on research growth and expertise of UNL faculty to strengthen economic development in Nebraska. University consultants in 2009 estimated Nebraska Innovation Campus could bring annual new payroll to the local and state economy of $267 million, including $149 million in direct annual payroll and $118 million in indirect payroll from new spin-off jobs over 25 years of phased development.